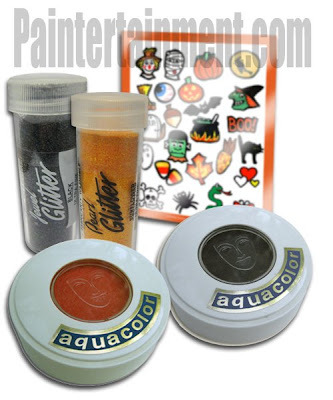 New Halloween Face Paint Package Deal! Now available: a new package deal for Halloween! This exclusive Paintertainment package deal is available only on this website. I have put together this package for those of you who are going to be face painting at a local Halloween event! Since you will most likely be using a lot of orange and black, you get a large cake of each of those colors, as well as glitter to match! Over a $36 Value for only $29.00! To avoid giving you more than you may need depending on the type of event, I have included just the basics. If you are going to be painting a variety of designs, to complement these essentials, I would recommend also purchasing at least one of the Aquacolor Palettes (6 or 12 color Aquacolor palettes) for the other colors, and if you don't already have them, some quality brushes. Other items that you may enjoy using for Halloween would be the neon yellow glitter (#385U), or even some of the UV-DayGlow fluorescent paints that glow under black light! You can have a lot of fun with face paints at Halloween, whether you're painting cheek art on kids at an event, or painting your own kids' faces as part of their costumes. Be sure to get your Halloween makeup early so you have plenty of time to play around with it, experiment, and get the hang of it in time for the big night! Finally...My Favorite Glitter for Face Painting! I am really excited to announce that I now have ultra fine glitter available on Paintertainment.com and ready to ship! 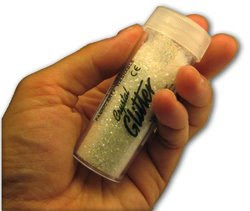 This is the exact glitter that I have been using exclusively for the 12+ years that I have been face painting. It took me until now to finally locate the manufacturer to add it to my selection of products! In my professional opinion, it is the BEST glitter to use on face paintings because it has super fine granules (.008"), which are considered cosmetic and safe for skin by the FDA. The super fine granules are ideal for applying to face paintings because they are light enough to stay on the design without falling off right away when the paint dries, like coarser craft glitter does. They also enhance your designs, rather than cover them up. You can get some really nice effects by applying some of the brighter colors on their corresponding paint colors. You can see samples of face paintings that I have done with glitter on my work examples page. Yes, I even have black glitter! It looks great on designs like Darth Vader or a black spider, and the boys love it! Glitter can really add a lot to your designs, if you use the right kind! I also have a great selection of pastel glitters. In my experience, if you only have one kind of glitter in your set of supplies, I would make it the blue-violet (231U). Blue-violet looks fantastic on top of any paint color without hiding your designs! I have usually around 8-12 colors of glitter to choose from in my bag of supplies at any one time. I like to store my glitter in mini glass jars...the kind that you get those little jam samplers in around Christmas time. I have seen some people use film containers too. Something with a tight fitting lid works best, and a wide enough opening to dip your finger in to dab it on. I also have screw-together stacking clear jars on my site that work great as well for storing multiple colors.